After our Legislature tour, we drove over to the Fairmont Hotel MacDonald to check out this cap. We found outside 1 hr parking in front of the Marriot and walked over to GZ. Conditions were cold and foggy today, but the views were still great. 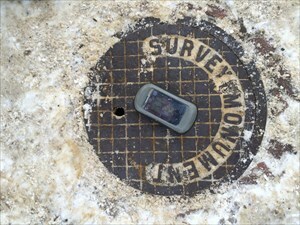 The cap was an easy find with the large survey cover in the sidewalk. We cleared the seam of ice and popped off the lid to expose the cap. Nice! We then took in the great river views before heading back to the car. Another fun cap OFTH. Thanks!